Here’s a grand recipe for lasagna that may or may not be the most excellent you have ever tasted. Whichever way, it is sure to be huge a hit every time you dish it up to your friend and family. In a bowl, combine the sausage and the beef together. In a pan, sauté the peppers and onions in olive oil or butter until they are soft. In another bowl, mix together the cottage cheese, eggs, parmesan cheese, pepper and parsley. In a large pot, cook the lasagna noodles according to package directions. Rinse noodles in cold water and drain. In a large non-stick baking pan, pour in 2 cups of the spaghetti sauce. Add a layer of lasagna noodles on top. Add a thin layer of spaghetti sauce over the noodles. Next, add a thin layer of the cottage cheese mixture, followed by layers of meat, onions and peppers, shredded cheese and mushrooms. (note: save enough shredded cheese for the very top). Cover filling with the final layer of noodles. Spread a thin layer of spaghetti sauce on top of noodles, and then sprinkle the remaining shredded cheese on top. Place uncovered pan in the oven and bake until the top is a golden brown color and filling is bubbly. Whether you are a vegetarian or not, this low fat vegetable lasagna recipe is a healthy meal and you won’t even miss the meat. In a pan, sauté the onions in the olive oil until they are soft; drain. In a bowl, combine the onions, cottage cheese, spinach, oregano and pepper. Prepare lasagna noodles according to package direction; drain. Oil a 9 x 13-inch pan and layer about 4 or 5 of the cooked noodles on the bottom. Layer the spinach/cottage cheese mixture, sauce and mozzarella cheese over the noodles. Add the final layer of noodles on top and cover with remaining marinara sauce. Cover pan with aluminum foil and bake for 40 minutes, Uncover and bake for another 15 minutes. 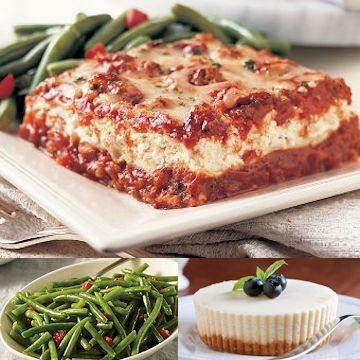 If you are looking for easy lasagna recipes with chicken, give this savory dish a try. It is loaded with Italian seasonings and, of course, lots of cheese. This chicken lasagna will truly become one of your favorites. Sauté the chicken, mushrooms, garlic, onion, oregano, basil and thyme in the olive oil until the chicken turns white in color. Stir in the tomatoes, tomato sauce, the 3 tablespoons Romano cheese, carrots, salt and pepper. Cook uncovered for 5 minutes. Oil a 9 x 13 baking dish and layer half of the lasagna noodles on the bottom. Next, add layers of the tomato sauce, chicken mixture, remaining Romano cheese, mozzarella cheese. Repeat layers until you run out of ingredients. Cover pan with aluminum foil and bake for 20 minutes. Uncover and bake for another 30 minutes. Cheese should be melted on top. If you have been searching for the perfect recipe for seafood lasagna, then look no further. Your quest has ended. This lasagna dish is brimming with shrimp, crab, five kinds of cheeses and lots of creamy flavor. In a pan, sauté the onions in the butter. Combine the cream cheese, cottage cheese, egg and basil together in a bowl. Mix in the onion and salt and pepper to taste. Layer cooked noodles on bottom of 9 x 13 baking pan. Layer with cottage cheese mixture, and pour the entire can of mushroom soup over the cottage cheese mixture. In another bowl, mix together the milk, wine, shrimp and crab meat. Spread 1/2 of the seafood mixture over the soup layer. Repeat the layers of noodles, cottage cheese and seafood. Sprinkle the top with the Parmesan cheese. Bake for 45 minutes. Remove from oven and sprinkle on the Cheddar and Mozzarella cheeses. Return to oven and bake for another 3 to 5 minutes, until cheese on top is melted. Let stand for 15 minutes before serving. Here is a great tasting mashed potato recipe featuring tangy mustard. You can experiment and try it with honey mustard and any other flavored mustard you enjoy. In a small bowl, reserve 1/4 cup of the chili beans including the juice; set aside. In a large skillet, brown the turkey meat. Add in the taco seasoning, cumin, red pepper, hot sauce, salsa, remaining chili beans and stewed tomatoes. In the bottom of a baking dish, lay one tortilla shell on bottom of dish. Add a portion of the cheese on top, and layer the meat next. Add another tortilla shell and repeat the layering of ingredients. Sprinkle what is left of the shredded cheese over layers and add the reserved chili beans. Sprinkle parsley on top. Gently press the mixture down into the pan.